With its distinctive nutty taste and texture, quinoa has enjoyed a surge in popularity in recent years and routinely fills the lunchboxes (and stomachs) of health-conscious office workers across the country. For good reason, too: compared to couscous, its fluffier cousin, quinoa has significantly more to offer in terms of nutritional value and contains an impressive amount of protein per portion. Quinoa is the perfect weapon to have in your culinary arsenal for lunch on the go, and can also make a fantastic starter or midweek supper. Browse our collection of healthy quinoa salad recipes for some delicious inspiration to spice up your lunchtime routine. 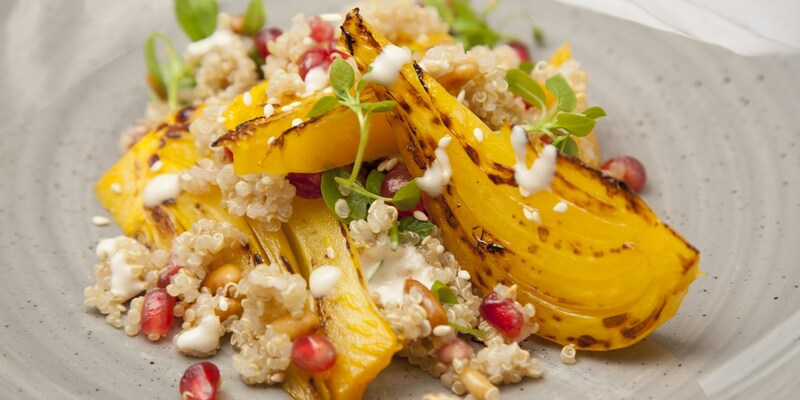 Shaun Rankin's colourful quinoa salad recipe combines zesty orange with tender fennel and a creamy tahini dressing, while Deena Kakaya opts for a vibrant blend of vegetables in her Pepper, carrot and paneer quinoa salad recipe, drizzled in teriyaki dressing.